General Banking department performs the core functions of a branch. General Banking department is that department which is mostly exposed to the maximum number customers. It is the introductory department of the Bank to its customers. A bank does not produce any tangible product to sell but does offer a variety of financial services to its customers. The Kawran Bazar branch of The City Bank Limited has all the required sections of general banking and these sections are run by manpower with high quality banking knowledge. Hence, a touch of rich customer service is prevailing in the branch. They take the deposit from the customer and pass entry of every transaction within the day. It opens new accounts remit funds, issue Bank drafts and pay order etc. Since Bank is confirmed to provide these services everyday, that’s why the General Banking is known as the ‘Retail Banking’. While accepting these deposits, a contract is done between the Bank and the customer. When a banker opens an a/c in the name of a customer then arises a contract between these two. This contract will be a valid one only when the parties are competent to enter contracts. As a/c opening initiates the fundamental relationship and since the banker has to deal with different kind of person with different legal status, The City Bank Ltd. official’s remain very much careful about the competency of the customer’s. The depositor’s deposit a fixed amount for a fixed period of time. A FD receipt is issued to the depositor acknowledging receipt of sum money mentioned therein. IT also contains the rate of interest and the date on which the deposit fall due for payment. In STD A/C the deposit should be kept for at least 7 days to get interest. The interest offered for STD is less than that of saving deposit. In The City Bank Ltd. various big company, organization, government departments keep many in STD a/c. Frequent withdrawal is discouraged and requires prior notice. In The City Bank Ltd., usually customers give an instruction to the Bank that their CA will be debited whenever its deposited amount crosses a certain limit and this amount ­will be transferred to the STD a/c. Current account is an account where numerous transactions can be possible by the account holder within the funds available in its credits. No interest is paid on those deposits. A current is a running and active a/c, which may be operated upon any no of times during a working day. There is no restriction on the amount of withdrawal from a Current Account. and collect bills drafts, cheque for any no. The Bank is therefore don’t pay interest on current deposit while on the other hand, some Banks charges on a/c’s. The bank gives overdrafts facilities a certain case. The banks grant the loans and advances though current accounts. To encourage savings habit amongst the general public, bank allows depositors to open savings account. As the name indicates, these accounts are opened for the purpose of savings. Interest is awarded on the balance of the account. Only 13% of the saving deposits are demand deposit and rest of is time deposit. allowed per week. If there are more than two withdrawals are made in a week no interest will be paid on rest of amount of that month. The total amount of withdrawals on any date should not exceed 25% of the balance in the a/c unless 7 days advance notice is given. Banks deposit grew by 29% in 2006. Total deposit stood at Tk 39572 million with an increase of Tk 8924 million. 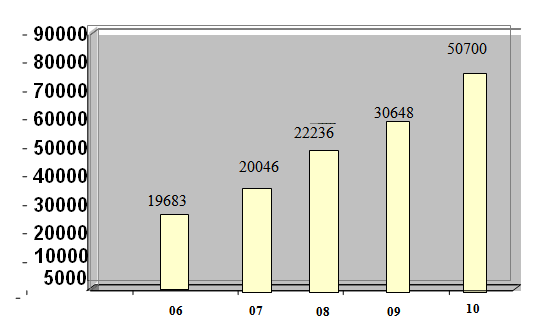 The deposit position in the year 2005 was Tk 30648 million. The growth was supported by branch network and high standard service provided to customers. Fixed deposit remained the main component of deposit contributing about 46% of total deposit. The relationship between the customer and the banker begin with the opening of an account by the customer. Opening of an account binds the banker and the customer into contractual relationship. But selection of customer for opening an account is very crucial for a bank. In fact all kinds of ford and forgery start by opening an account. So the banker should take extreme caution in its selection. An existing CA holder of the Bank. A respectable person of the location well known to the Manager/Sub-Manager of the Branch concerned. B. The type of account, the prospective Customer wishes to open should be ascertain. Highlight the main features of the account obtained necessary papers prescribed for opening of the particular type of account including two copies passport size photo of the account holder duly attested by the Introducer and verified by the Authorized officer of the Bank. Specimen Signature Cards (SS Card). E. Signature of the customer on the reserves of the signature card. Any special instructions with regard to operation of the account should be noted on the relevant signature card boldly duly authenticated by the account holder should be obtained. F. The required account no. For the new account from the account opening register should be obtained. collected. Then the new account no. Should be written at the appropriate place of the deposit slip and request the customer to deposit the money at the Teller’s counter. cards should also attest the signature of new a/c hold. Customer’s a/c of the amount of Exercise duty payable for the checkbook. of the branch on each leaf of the checkbook. To facilitate the withdrawals and payments to third parties by the customer, the bank contains ten leaves book to the customer. A savings account chequebook contains ten leaves and a chequebook of current account may be 20 pages or 50 pages. The account number is affixed on corner of each page. The withdrawal pages book contains one extra page called cheque requisition slip, which is signed by the account holder and verified by the authorized officer at the time of issuing a chequebook. The cheque serial is entered both in the chequebook issue register and in computer to the corresponding account. When an account is transferred from one officer to another, the account opening form etc. signed at the time of opening account and any forms or documents which are necessary for its proper conduct at the time of transfer, must be forwarded under cover of form, to the office to which the account is transferred together with the relative mail transfer, specimen signature cards) and standing instruction if any, no exchange should be charged on such transfer. Attention is also invited in this connection. An application to close the account from customer is received. TT is “Account payee only instrument. The customer can enjoy this facilities only A/C in the down on branch. Telegram, telephone, telex, or fax as desired by the remitter effects TT. Transfer of the funds by telegraph is most repaid and convenient but expensive method. The drawer and payee should have a/c with the bank. TT is issued against cash, cheque and later of instrument. Deposits of money by the customer along with filled application form. Tested telex message is prepared, when TT serial no. Notifying party name, a/c no. is mentioned. Telex section officer confirms transaction of message. There is the TT serial no. This is an instrument issued by the branch of a bank for enabling the customer/ purchaser to pay certain amount of money to the order of a certain person/ firm/ organization/ department/office in the same clearinghouse area of the pay order-issuing branch. The issuing branch and the paying branch are same. Application for payment with in the clearinghouse area of the issuing branch. This may be open or can be crossed. Obtain PO application form duly filled in and signed by the applicant. Receive the amount in cash/transfer with commission amount. Enter in pay order register. Examine genuinely of the pay order. Enter in to pay order register and give contra entry. Debit if fund ok for payment. The party will submit the pay order along with an application mentioning the reason of cancellation. If the pay order is submitted to the favoring party endorsement will be given on the pay order. Party will be charged an amount of TK.60/- as per cancellation charge. No cancellation charge will be charged if the favoring party will released the pay order. For every commission government charges 15% VAT of the commission. Filling up the prescribed FDR account opening application form. Signing on the SS card. The FDR block has different parts. The smaller one remains in the bank along with FDR block and the other one is received by the account holder as FDR receipt. The account holder as FDR receipt receives both of the other. Both of the FDR pages contain the same information. Serial number of the FDR. Received form (name of the account holder). The rate interest and period. These interest rates is calculated and revised by finance division located at the corporate office of The City Bank Ltd. And forwarded to all the branches. Months he /she want to withdraw, and then interest will be given for 6 months, not for 1 year. Stamp is mandatory, when closes the FDR account, this is needed. It contains the signature of the accountholder, which is verified later. If the account holder allows the provision of auto renewal then the FDR account will be auto renewed after the maturity. The renewal will be for another three month. Conveyance: Going outside in office time for official purpose. Magazine: Pay the bill of newspaper and magazine. According to the article 37(2) of Bangladesh Bank Order.1972 the banks, which are the member of the clearinghouse are called as Schedule banks. The scheduled banks clear the house drawn upon one another through the clearinghouse. This is an arrangement by the central bank where everyday the respective member banks gathers. Banks for credit of the proceeds to the customers’ accounts accept cheque and other similar instruments. The bank receives many such instruments during the day from account holders. City Bank Kawran Bazar branch receives different types of instruments, such as check, pay order, demand draft (DD), from its customers for collection. It also pays on behalf of its customers for those instruments that come to it through clearinghouse. When instruments of City Bank are sent for collection or received for payment through clearinghouse it is called Inter Branch Collection or IBC. The whole process of collection and payment would involve considerable labor, delay, risk and expenditure, all the labor. Risk delay and expenditure are substantially reduced, by the representatives of all the banks meeting at a specified time, for exchanging the instruments and arriving at the net position regarding receipt. The process of collection of cheque’s and other instruments from branch to branch of a bank is known as transfer delivery. The branch received the instruments through deposit slip. All the essential of an instrument is then checked. Entry is given in outward register. Courier/ attendant send the cheque with a schedule to the drawer branch. The responding branch will collect the instrument from the messenger. Entry is given in inward register. If the instrument is honored then responding branch will send an IBCA. H.O a/c (responding branch) ………………… Cr. Collection of check of a bank outside the clearing zone is known as OBC. It refers the instruments drawn on the other Banks received by the City Bank Ltd. Accepting the instrument with deposit receipt from the client. Investing the instrument and deposit receipt carefully, specially date of check, amount, and account number, name, and sign of depositor. The following seals are applied on the instruments; like OBC seal with OBC number, Endorsement seal. Entry in the OBC registers. Making two copies of schedule. One is enclosed with the instrument for collecting and the other one ID used as office copy. Instrument attached with forwarding schedule is send to the bank on which the check has been drawn. When a check comes to the bank from another branch outside the clearing area, the process is called IBC. After collection of check an IBCA is send to the OBC sending branch. Sending the OBC is not enough for marking payment. We send the remained on instrument drawee bank to send back the instrument may be placed more than one time for payment. How many accounts have to be kept in the counter, volt and transit decided by the size and mode of transaction of the branch. of the information are received regarding cash remittances. Shall supervise the cash remittance under direct guidance of Sub-Manager. Shall be responsible for any receipts and payments as per circular issued from time to time. Count the notes and list the amount on the back of deposit slip in order to denomination starting from the highest. Compare listing with the cash amount shown on the face of the deposit slip. Place the cash drawn duly stored according to the denomination. Enter the particulars such as serial no, account no, title of account received in the cash receive register. Put cashier’s signatures on the deposit slip and simultaneously get the same countersigned and the entry in the cash received register duly authenticated by the head cashier/officer. Validate the deposit slip on the face with the validating rubber stamp and return to the depositor, retaining officer copy for bookkeeping purpose. The token Clark issues a token to the presenter against of cash check after scrutinizing the material part of the check, the no of the entries with his initials on the back of the check under a rubber stamp. The check is also scrutinizing by the computer operation/officer who must satisfy himself that it is the order in every respect that it is from drawer’s S/B. a check book and that the amount does not exceed the credit balance of the amount. He will then the post the amount in the ledger, entry the folio no in the left corner of the check. Then the check is sent to the authorized official who offer satisfying him that in every respect inclusive of verification signature will pass it for payment and recording the entries in cash payment register. Both the cashier and head cashier will put their initials against the entries in the cash payment register. After payment of cheque/instrument the cashier affixes the PAID seal on the instrument. The documentation of the currency notes paid is also recorded on the back of the instrument. The City Bank Limited is one of the fastest growing banks among all the private commercial banks in Bangladesh. This bank constantly looks for ways & means to improve productivity by rendering to its customers in order to remain competitive in the market. The City Bank Limited plays a significant role in various fields in the economy such as industry, trade & commerce, transportation, deposit mobilization etc. It is playing a crucial role in human resource development and in creating new employment opportunities. It is also undertaking various welfare activities for the betterment of the society, in this context the bank has established The City Bank Foundation. The reliability of the customers on The City Bank Limited is increasing promptly day by day. The overall performance of The City Bank Limited solid revenue growth together with strict discipline on expenses. The bank constantly reviews its systems, policies, process and prices of its products and services with the changing marketing reality. Top management of The City Bank Limited should conduct a comprehensive study or survey on the branch performance, its management performance and their motivation as well. The marketing department should think freshly about their objectives and practices. As a developing private bank The City Bank Limited should allow their client satisfied with their services. From my observation, the front desk people need more training to handle people smartly. In clearing section, there are not any trained employee and work delayed with mistakes often, even there are not any specific document regarding clearing vouchers. So, training is mandatory for this department for overall benefit and smart work along with client satisfaction. Motivation is the key to employee satisfaction and employees are satisfied productivity will increase, profit of the organization also increased rapidly with customer satisfaction. When I have worked in cash section I have seen that employees of this section gets minimal salary compared to other sections of the bank and they are not satisfied with their salary, so management should think of them. 1. Annual Report of The City Bank Ltd.